New Labor Law Posters Available NOW! Labor Laws Poster Now Available Through NAE! NAE is proud to announce that we now offer an all-in-one state and federal labor law poster for Nevada employers. Make labor law posting compliance easy with our Nevada & Federal Labor Laws poster. Purchase your all-in-one poster today! 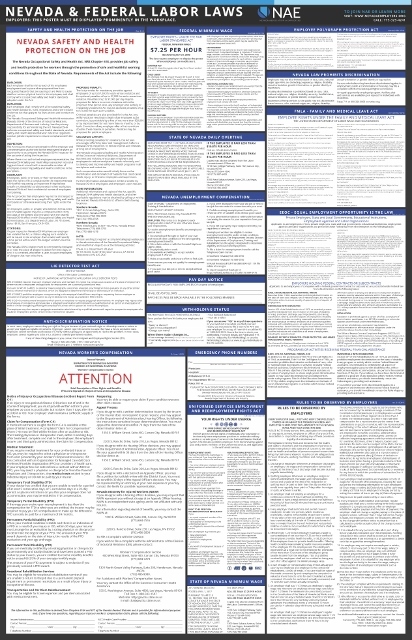 The all-in-one poster (pictured left) contains all required federal and Nevada labor law notices in one convenient 25″ x 39″ laminated poster. Keep it simple. Get your Nevada & Federal Labor Laws poster today. NAE members will still be able to download the latest federal and state labor law posters individually from our website. Your member ID is required to access the posters for download. Ordering the all-in-one poster is easy! Complete the order form located HERE. Please allow for 7-10 business days for processing and shipping. For questions regarding the all-in-one poster or your order, please contact us.